Using logic, many people would deduce that if the vegetable and fruits are eaten in their raw form, the nutrients can be directly absorbed into the body more easily. Nutrients such as vitamin A and C are often destroyed from cooking. There are groups that advocate only taking organic food only in their raw form- therefore, a lot of people take salad in their meals. For scenarios above, minimize your intake of raw food if you do not wish for the conditions to flare up. And use ginger often in your cooking- even small amount of them. I want to share with you on my personal experience. 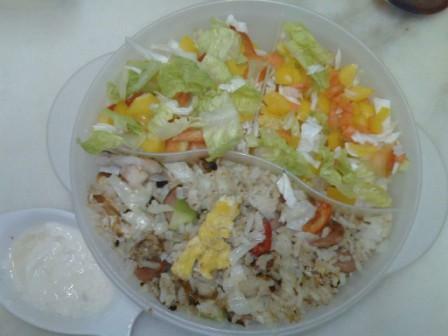 Few months ago, I started incorporating salad- ie cut vegetables together with my food. I applied the principles of glycaemix index balancing in my food- as Asians, our diets are predominantly carbohydrates- ie fried noodles, rice, etc- containing high GI. After noticing that I tend to crave for more carbs after eating lunch of high GI- like rice and noodles, I added raw salad into my lunchbox. The method works and after lunch, my stomach does not feel as though it had fallen asleep and the sluggishness feelings were very much reduced. However, I started experiencing a strange sensation not long after I started putting in raw vegetables- it was very funny but the central point of the sole of my right feet seemed to be ‘leaking out air’. It almost feel like air is going out from that central point of my leg. Not only that, especially my right leg seemed to feel more numb. I exercise frequently and even with running, the numbness returned after a short while. There was a time where I thought that it could be due to the raw food I am taking but later I shrugged it off- after all, I only take it in a meal a day- and during weekdays only (but I underestimate the havoc they caused to my predominantly ‘yin’ body). Then, I called my healer friend recently and asked her why that happens- I did not even tell her I was taking raw food but she immediately told me that there is too much ‘wind’ in my body causing blockages. As the result, the blood in my leg could not flow properly and hence, the numbness occurs. If this is allowed to go on, it would result in arthritis later on because of the blocked ‘wind dampness’ in the joints. By that time, it will be hard to dispel. She said that at least I am a bit fortunate in the sense that the ‘wind’ moves out through my soles- it would be dangerous if it gets trapped in my body. Immediately I knew it was due to the raw vegetables that I was taking for the past few months. This healer friend of mine is illiterate because she’s almost 80 years old but that ability to heal in her is inborn. I asked her if massage can help and she told me that provided the massager is really qualified- she cited a few cases where a few ladies they knew went for massage for their leg numbness and pain- it did not work even after a few years. What she did was to pick up some natural herbs and boil it and they got better. What she shared with me coincide with what I have learned in Chinese medicine- that how smooth our blood flow in our body depends on the strength of our internal organs like the spleen, liver and lungs that governs the flow of ‘chi’ in our body. You can take neobion or supplements- and research can diagnose all types of nutrients deficiencies which will come out in the form of even more new supplements being produced. But you may notice that taking it can only help for a while- the moment you stop taking these supplements, your problem will come back- almost immediately. Think about this, if the cause is really eliminated by these supplements, your problems should go off for good even though you are off those supplements. Therefore, if you find that you have been experiencing symptoms that I’ve described above, all I am asking you to do is to check if you have been taking too much of raw and ‘cold’ food/drinks as well as celyonese tea. ‘Cold’ food/drinks includes ice cream, sorbets, cool water. Having salad is good but instead of taking it raw, just steam the vegetables for a short while. It may remove some of the nutrients but the heating process will dispel a lot of ‘yin’ energy from the food. Thanks. Remember to drink more warm water too. Sometimes I get numbness when I drink too much iced drinks.